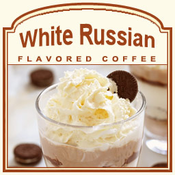 The White Russian flavored coffee is a melt-in-your-mouth, creamy, and smooth coffee that features flavors of white chocolate mousse, rich, dark Mexican liqueur, and a mellow and fluffy creaminess. The White Russian flavor and aroma is infused with 100% pure Arabica coffee, which brings you luxurious flavor and taste of this cocktail-inspired coffee. Although this White Russian is non-alcoholic, you will still have a kick from the fabulous flavor. With only 2 calories in each cup, the White Russian flavored coffee will offer a sublime sweetness. At FlavoredCoffee.com, we are all about helping you save money by giving you the best deals. Buy our money-saving, 5lb bulk bags of your favorite flavored coffee so you can share with friends and coworkers, or make your own supply last a little longer. Packaged in a heat-sealed valve bag, this White Russian coffee will be roasted and shipped on the same day. Perfect served hot or cold, this White Russian coffee features flavors that will offer a unique blending of smooth chocolate and liqueur flavors. Delicious and sweet, the White Russian coffee will liven up any party!